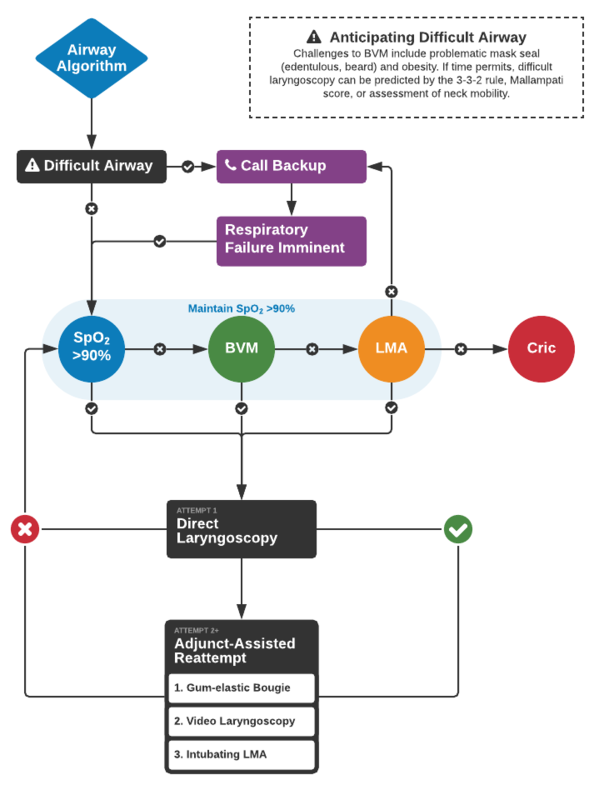 An airway management algorithm, developed with Dr. Diane Birnbaumer, has been previously developed on ddxof: airway management algorithm. The algorithm provides detailed, step-by-step recommendations for specific airway classifications – divided into normal, anticipated difficult, crash, and failed airways. While helpful as an educational tool, the algorithm is likely too complex for rapid review or bedside application. Admittedly sacrificing some detail, this simplified airway management algorithm highlights the critical steps, incorporates only the most commonly-used airway adjuncts, assumes imminent respiratory decompensation and failure of progressive intubation attempts.